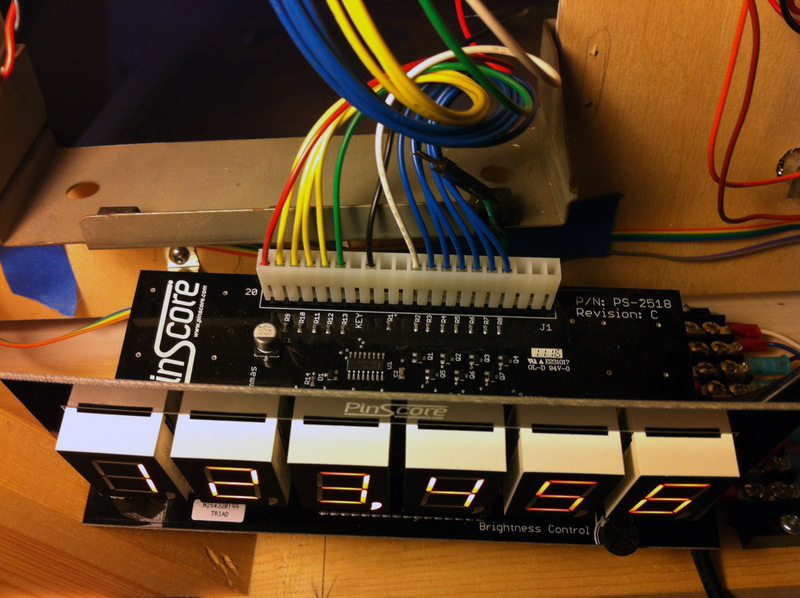 PinScore makes reproduction displays, using the latest technology for higher reliability. 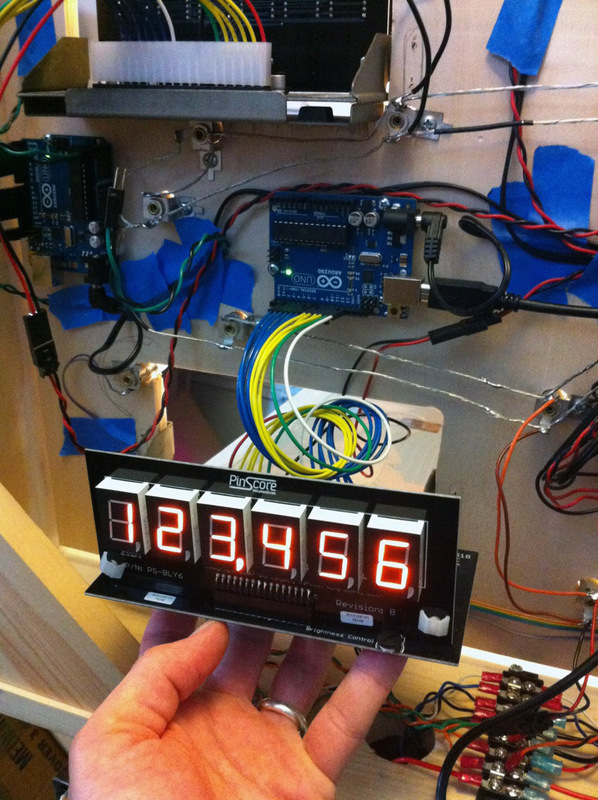 An Arduino can be used to drive a PinScore display, while also communicating serially with a game controller. LS150-5 – Power supply, 5V. CA-2187 – 2.1mm barrel cable. The Arduino IDE is a free software download, with a large support community, and can be downloaded here. Detail shot of Arduino showing connections and pinouts. Using the parts list above, you should have everything you need to connect the PinScore to the Arduino as shown above and below. Detail showing connection side of PinScore with header pinout to Arduino. I’ve provided some test code at the bottom of the page that can be cut-and-pasted into an Arduino project. 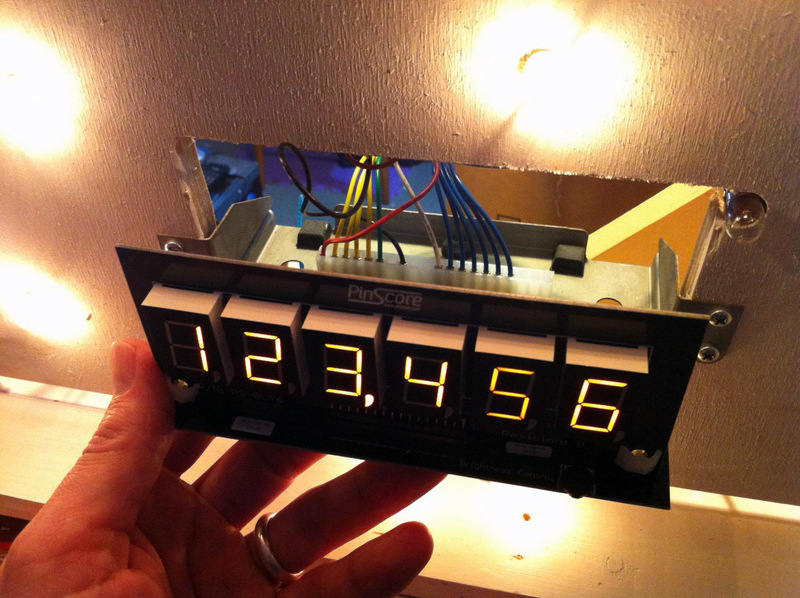 The photo below shows the display being mounting into the front of the light board, with the test numbers “123456” loaded. 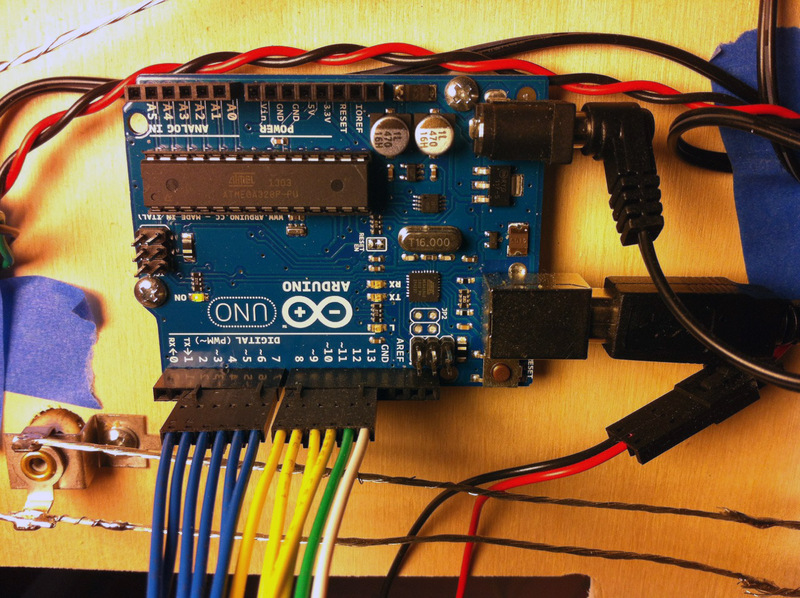 The Arduino project is set up to use the Serial interface, which for diagnostic purposes can be accessed over the same USB programming plug, and the Serial Monitor built into the Arduino IDE. 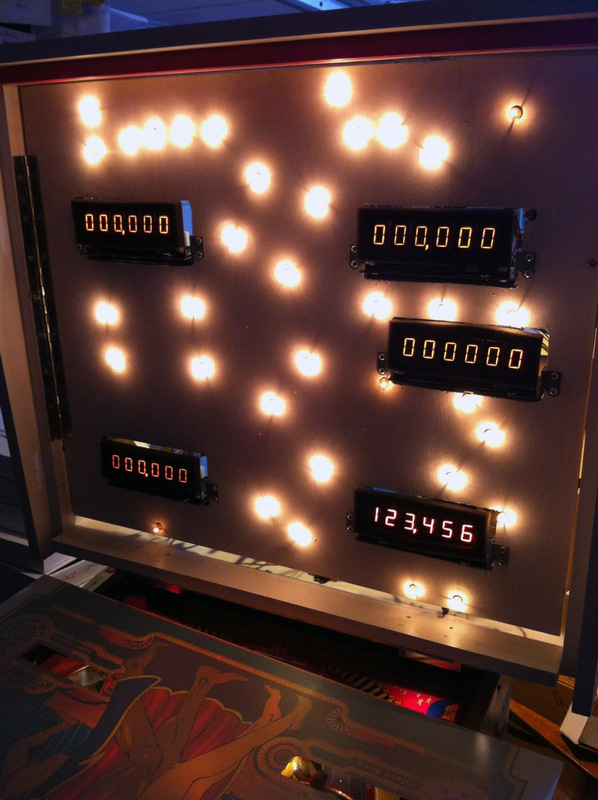 Display mounted from the front into a standard Bally score bracket. Below shows all the displays installed, waiting for the backglass. Finished installation showing all five displays and the lit up back-board. Plug your target board (with PinScore display attached) into your computer via USB. Power the PinScore with external 5V supply. Download the program to the target. Open the Serial Monitor built into the IDE Tools. Type “$pinXyyyyyy” and press return, where X is the number you assigned the display (i.e. player 4), and yyyyyy is the number or score you want to display. For example, “$pin4123456” is what I typed in to display what is in the photos above. If your score is less that six digits, use an underscore. For example, “$pin4_98765” will display the number 98765, with the first digit being blank. If you have a fifth display for Balls/Credits, you would sent something like “$pin5_03_10” for Ball = 3 and Credits = 10. Cut and paste text into a new project, then download to your target device. 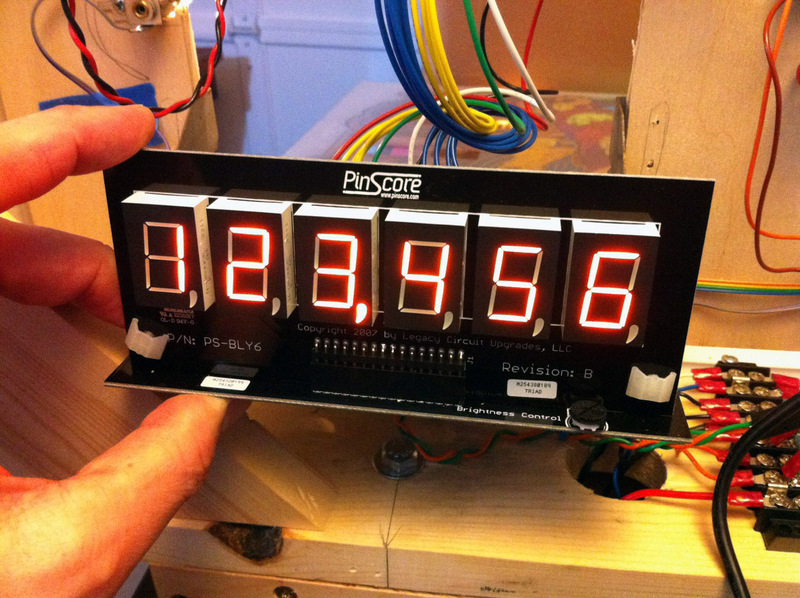 for the PinScore display (ie, 1, 2, 3, 4 etc), and then the actual score for that unit. the score "100000"  player four's display. response. Multiple bytes of data may be available.